This technique has been practiced in Europe for nearly 80 years. The first description by Bourget in 1928  was followed by the account of Tessier in 1973  of this approach for blepharoplasty, trauma, and congenital deformities. Isolated reports of this technique for blepharoplasty began appearing in the North American literature during the 1970s  and 1980s  , but the landmark contribution by Zarem and Resnick in 1991  propelled this procedure into more widespread acceptance. Although earlier studies focused on the young patient with isolated fat excess, indications for the procedure may be expanded to include older patients with some degree of cutaneous redundancy. Many studies now report excellent results and a reduced incidence of postoperative lower lid complications. As more experience with this technique is shared and results reviewed, reports have shown fewer complications and less apparent morbidity than with the transcutaneous approach. A: The lower eyelid is evaluated for the presence or absence of adequate tone. The snap test is shown. This involves pulling the lower eyelid skin away from the globe with the thumb and index fingers. B: This photograph demonstrates the lid retraction test, which involves displacing the lower eyelid inferiorly in order to evaluate lower eyelid tone. C: This is a preoperative oblique view. Note the brow position in relation to the orbital rim. Note also the excessive eyelid skin and crow's feet in this particular patient. D: Preoperative frontal view of the same patient. Note the lower position of the left brow, the redundancy and asymmetry of the upper eyelid skin, and the crow's feet in the lateral orbital areas. In the aging face the nasojugal groove, or tear trough, can become a significant cosmetic issue resulting from changes in the infraorbital region causing the tear trough deformity. This deformity can occur along with excessive lower eyelid fat herniation or alone. Multiple options for correction of the tear trough deformity have become available and are often considered a part of the blepharoplasty procedure. Lower lid blepharoplasty (transcutaneous or transconjunctival) is not meant to address fine skin wrinkling. This issue may be better addressed with either chemical peels or laser/mechanical resurfacing. Inferior periorbital fat is contained posteriorly by the capsulopalpebral fascia and overlying conjunctiva of the posterior fornix. 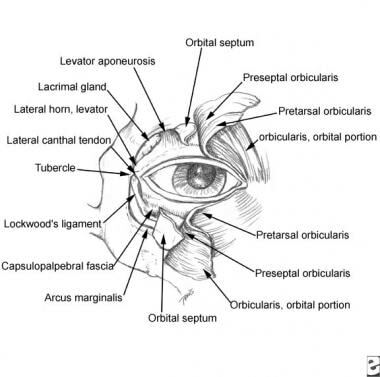 Surgical anatomy of upper and lower eyelids. The capsulopalpebral fascia fuses superiorly with the inferior tarsal muscle, which inserts into the lower border of the tarsal plate. 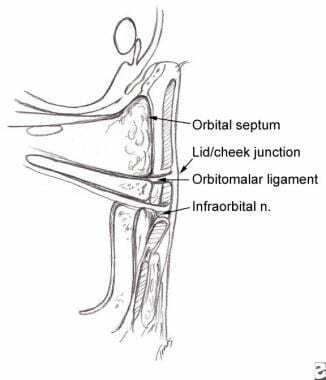 Anteriorly, the fat is bounded by the orbital septum, which separates it from the overlying orbicularis oculi muscle and lower lid skin (see the images below). With age, these tissues may relax, and the orbital fat may herniate forward, which presents as unnatural fullness of the lower lid. This bulging of the lower lid can also cause a hollowed look of the upper lid, as the entire orbital contents drop. Cross-sectional anatomy of the mid face. Cross-sectional anatomy of the mid face. 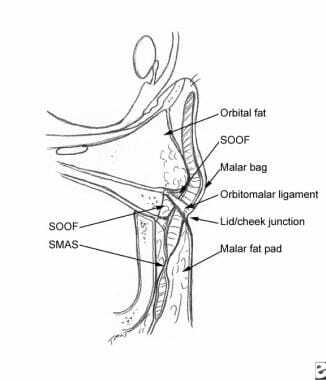 SOOF indicates suborbicularis oculi fat; SMAS indicates superficial musculoaponeurotic system. Transconjunctival blepharoplasty permits access to the orbital fat by an incision through the inferior conjunctiva and capsulopalpebral fascia without any disruption of the skin and orbicularis muscle of the lower lid. This approach avoids violating the inferior orbital septum, which may result in less postoperative eyelid retraction, scleral show, and changes in the shape of the aperture, which may complicate the transcutaneous approach. The inferior oblique muscle is an important anatomic landmark. It arises from the anteromedial portion of the orbital floor and passes posterolaterally, separating the medial and central fat compartments during its course. The lateral and central fat compartments are separated by the arcuate expansion of the inferior oblique muscle. This diaphanous structure inserts into the orbital rim anterolaterally. The upper lid classically is divided into an anterior (skin and orbicularis) and a posterior (tarsus and conjunctiva) lamella. The supratarsal fold results from a fusion of levator aponeurosis, orbital septum, and fascia on the deep surface of the orbicularis muscle. The fused layer acts as a sling for the periorbital fat and is higher medially than laterally. In an attempt to divide the orbital septum medially in a conventional blepharoplasty, this fused layer may be damaged inadvertently. Generally, the presence of either 2 or 3 upper lid fat pads is accepted. The medial fat pad is typically pale yellow or white and lies medial to the levator aponeurosis at the root of the nose. It has a greater connective tissue component and is innervated by the supratrochlear nerve. The middle and lateral fat pads lie on the levator and are a rich butter yellow color. They are innervated by the supraorbital nerve. Dry eye exposure is a risk of any surgical manipulation of the upper or lower lids. Patients who have undergone corrective vision procedures such as laser in situ keratomileusis (LASIK) or keratotomy have an increased risk of dry eye problems and should be cleared for further surgery by their refractive eye surgeon. Patients wearing contact lenses pose a particular risk when blepharoplasty is considered. Eyes may dry out as a patient ages, and this process is often hastened by chronic contact lens use. Additionally, eyelid surgery such as blepharoplasty, canthopexy, or other lid altering procedures may subtly affect the curvature of the cornea, making use of contact lenses uncomfortable or even dangerous. Patients should discontinue the use of contact lenses weeks before surgery and not restart use for several weeks postoperatively to allow healing without any eyelid manipulation. Nahai F. Transconjunctival blepharoplasty. Nahai F. The Art of Aesthetic Surgery: Principles and Techniques. St. Louis, Missouri: Quality Medical Publishing, Inc.; 2005. Chap 22, pp. 720-50. Silkiss RZ, Carroll RP. Transconjunctival surgery. Ophthalmic Surg. 1992 Apr. 23(4):288-91. [Medline]. Zarem HA, Resnick JI. Minimizing deformity in lower blepharoplasty. The transconjunctival approach. Clin Plast Surg. 1993 Apr. 20(2):317-21. [Medline]. Taban M, Taban M, Perry JD. 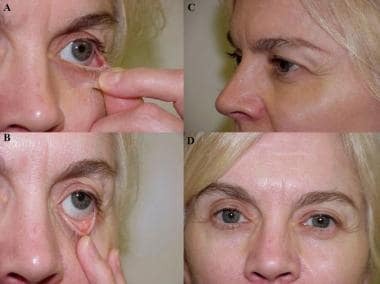 Lower eyelid position after transconjunctival lower blepharoplasty with versus without a skin pinch. Ophthal Plast Reconstr Surg. 2008 Jan-Feb. 24(1):7-9. [Medline]. Bourget J. Notre traitement chirurgical de "poches" sous les yeux sans cicatrice. Arch Gr Belg Chir. 31. 133:1928. Tomlinson FB, Hovey LM. Transconjunctival lower lid blepharoplasty for removal of fat. Plast Reconstr Surg. 1975 Sep. 56(3):314-8. [Medline]. Baylis HI, Long JA, Groth MJ. Transconjunctival lower eyelid blepharoplasty. Technique and complications. Ophthalmology. 1989 Jul. 96(7):1027-32. [Medline]. Zarem HA, Resnick JI. Expanded applications for transconjunctival lower lid blepharoplasty. Plast Reconstr Surg. 1991 Aug. 88(2):215-20; discussion 221. [Medline]. Soll SM, Lisman RD, Charles NC, Palu RN. Pyogenic granuloma after transconjunctival blepharoplasty: a case report. Ophthal Plast Reconstr Surg. 1993 Dec. 9(4):298-301. [Medline]. Stutman RL, Codner MA. Tear trough deformity: review of anatomy and treatment options. Aesthet Surg J. May 2012. 32(4):426-40. [Medline]. Januszkiewicz JS, Nahai F. Transconjunctival upper blepharoplasty. Plast Reconstr Surg. 1999 Mar. 103(3):1015-8; discussion 1019. [Medline]. Undavia S, Briceno CA, Massry GG. Quantified Incision Placement for Postseptal Approach Transconjunctival Blepharoplasty. Ophthal Plast Reconstr Surg. 2015 Apr 20. [Medline]. Pechter EA. Transconjunctival lower blepharoplasty through interrupted incisions. Plast Reconstr Surg. 2009 Jul. 124(1):166e-7e. [Medline]. Youn S, Shin JI, Kim JT, Kim YH. Transconjunctival Subperiosteal Fat Reposition for Tear Trough Deformity: Pedicled Fat Redraping Versus Septal Reset. Ann Plast Surg. 2013 May 30. [Medline]. Yoo DB, Peng GL, Massry GG. Transconjunctival Lower Blepharoplasty With Fat Repositioning: A Retrospective Comparison of Transposing Fat to the Subperiosteal vs Supraperiosteal Planes. JAMA Facial Plast Surg. May 2013. 15(3):176-81. [Medline]. Yoo DB, Peng GL, Massry GG. Transconjunctival lower blepharoplasty with fat repositioning: a retrospective comparison of transposing fat to the subperiosteal vs supraperiosteal planes. JAMA Facial Plast Surg. 2013 May. 15 (3):176-81. [Medline]. Mohadjer Y, Holds JB. Cosmetic lower eyelid blepharoplasty with fat repositioning via intra-SOOF dissection: surgical technique and initial outcomes. Ophthal Plast Reconstr Surg. 2006 Nov-Dec. 22(6):409-13. [Medline]. Sadove RC. Transconjunctival septal suture repair for lower lid blepharoplasty. Plast Reconstr Surg. 2007 Aug. 120(2):521-9. [Medline]. Segal KL, Patel P, Levine B, Lisman RD, Lelli GJ Jr. The Effect of Transconjunctival Blepharoplasty on Margin Reflex Distance 2. Aesthetic Plast Surg. 2016 Feb. 40 (1):13-8. [Medline]. Hidalgo DA. An integrated approach to lower blepharoplasty. Plast Reconstr Surg. 2011 Jan. 127(1):386-95. [Medline]. The authors and editors of Medscape Reference gratefully acknowledge the contributions of previous authors D Glynn Bolitho, MD, PhD, FACS, FRCSC, FCS(SA), and Foad Nahai, MD, to the development and writing of this article.